A few weeks back the Thai Red Cross held their annual Diplomatic Fair in which embassies and consulates in Bangkok sell items imported duty-free from their home countries, with the proceeds going to the Red Cross. Most of my purchases were wines imported by the US embassy, offered at about a 30% discount of normal retail prices thanks to the absence of a duty. I was especially tickled, though, when I found this wine for sale at the Hungary booth. 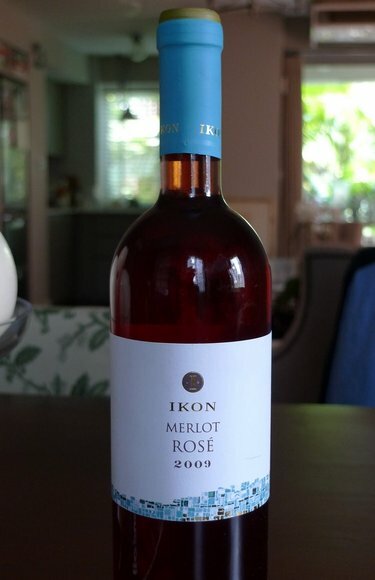 IKON wine. This is funny because that’s the company I work for, IKON Office Solutions. Who knew we had a namesake wine? For the record, this was a very nice, medium-dry rose. This entry was posted in Uncategorized and tagged Hungary, IKON, wine by christao408. Bookmark the permalink. Nice wine! After a 30% discount with no VAT, sounds good to me! The brand does ring a bell to me too. Hehe. Don’t tell them and then hunt for a couple bottles as gifts for work events… Unless they have a business on the side! I would glad to accept a complimentary bottle any time! That’s so cool Chris. You can open it when you have company, and tell the story about it. Great conversation piece. Ikon wine for the Xanga icon.